Jo qualified as a veterinary nurse in 1994; she gained her Diploma in Advanced Veterinary Nursing (Surgical) in 2000 followed by her assessing qualifications in 2001, internal verification qualification in 2003 and the Certificate in Education in 2005. 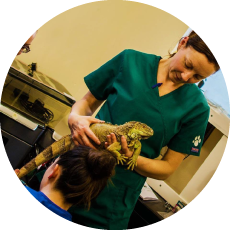 Most recently Jo has qualified as an exotics nurse, taking and passing the Certificate in Veterinary Nursing of the Exotic Species in 2015, following which she lectures on aspects of exotic, mainly reptile, within the UK. Jo has worked in small animal practice as a head nurse and assessor prior to moving into education in 2002 when she joined The College of Animal Welfare as a lecturer and internal verifier in 2002. Spending nine years with CAW Jo moved to a referral exotic practice where she gained the certificate. More recently she now locums for that said practice. Jo’s interests include all aspects of exotic nursing, anaesthesia and teaching / training.